You Deserved to Get This Best Nose Hair Trimmer! 1. 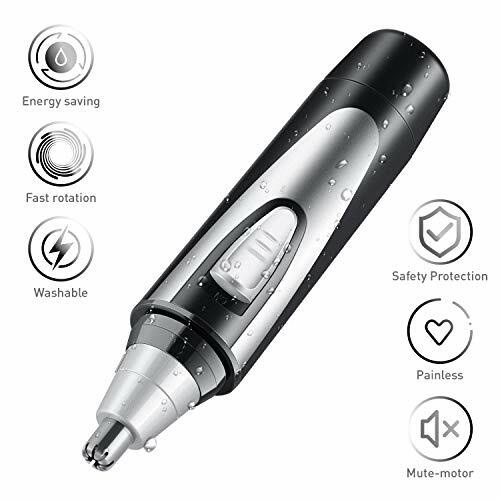 Lightweight but Powerful: Cordless electric nose ear hair trimmer with Micro vacuum cleaning system and Spinning Blades System, to achieve the goal of quick, painless, comfortable and convenient. 2. 360°Rotary cutting design: you can easily trim your nose ear hair particles all directions, at the same time, it will retain a proper amount of nasal hair to allow the body to inhale the filtered healthy air. 3. Mute Motor: The trimmer features With 6500RPM efficient system but small noise, It does not exceed 50 DB when trimming nose hair, and the noise is probably like the sound we communicate, so you can use it anywhere without worrying about affecting others, and you can enjoy this pruning process quietly. 4. wet/dry convenient: You can trim your nose, ear, and mustache in the case of wet and dry. With the wet/dry feature, the nose ear hair trimmer is waterproof and washable, you can clean it with water. 5. Safety: The outer safety cone precisely removes unwanted hair from your face, it also protects your skin from damage during trimming and retains the moderate amount of hair to ensure natural filtering. 6. Economic and efficient: An AA-size battery can drive the nose hair trimmer. After testing, if you use it once a day for 5 minutes, then you can use this battery for 6 months, but if you don’t use the trimmer for a long time, you’d better take the battery out. Kayla-ism nose ear hair trimmer for men women equips with dual-edge blades, which allow you comfortably and easily to trim nose and ear hair, detail beards and eyebrows, as well as unwanted facial hair. Moreover, those blades are hypoallergenic, curved and stainless steel, so it won’t nick skin or painfully pull hairs out from their root and won’t produce allergic reactions in even the most sensitive of users. Integrated rotary blade system &micro-vacuum system that provides circular blade action for more efficient trimming, and allows you to whisk away clipped nose, ear and facial hair as you trim, without leaving a mess in the sink and never pulling or tugging of hairs. The nose and ear hair trimmer is waterproof, so it can be safely used in the shower and easily cleaned under the tap. Eronomic design makes it easy to hold and position even if it gets slippery or wet. Kayla-ism nose hair trimmer has a 6500 RPM powerful but mute motor to take on whatever job you want such as trimming your mustache and sideburns. Though it is not specifically designed to be used on sideburns or neck hair, but it works just fine there as well. This nose hair clippers require a single AA battery (not included) for operation,but the trimmer gets you six months of use with one battery. It is lightweight but powerful, and the Battery-Operated make this nose ear trimmer more convenient and energy efficient. This entry was posted in Trimmers & Clippers and tagged 2018, BatteryOperated, Cleaning, Clipper, Hair, Motor, Mute, Nasal, Nose, Painless, System, Trimmed, Trimmer, Vacuum, Waterproof, Woman.